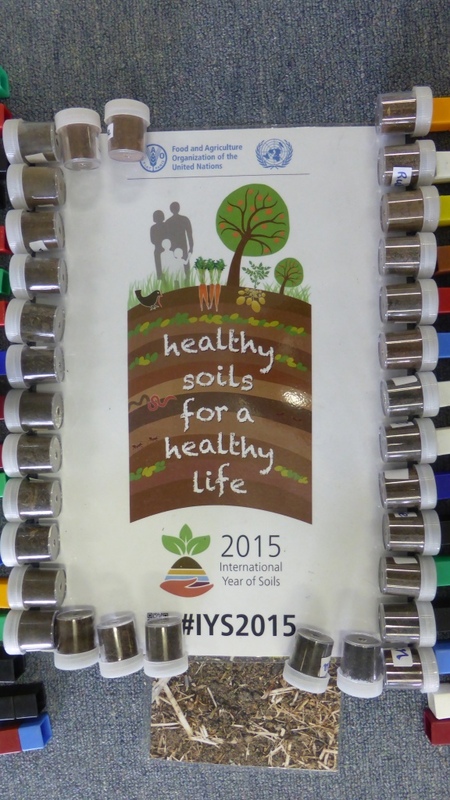 experience the relevance of the IYS theme “Healthy soils for a healthy life” in their lives by using soils from the children’s homes. appreciate that Science, at its base, is a way we learn things about our world by repetitions of 1. noticing (observing) 2. recording (including in our brains) 3. sharing ( in many ways) and in the final session 4. act on the knowledge gained . 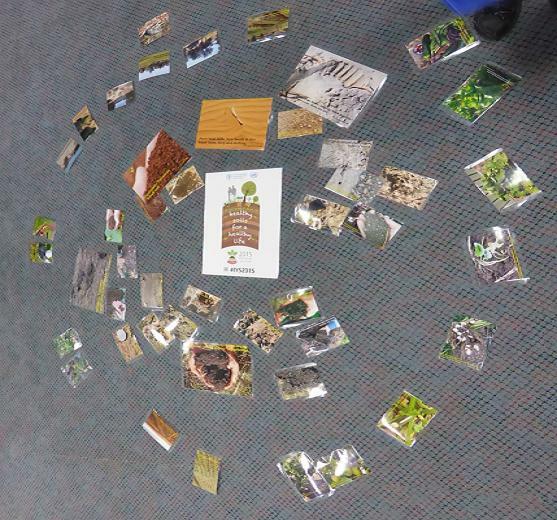 This introduction involved discovering what soil is and some variations in colours and uses of soils that contribute to healthy soils for a healthy life, using prior experiences and the Soil Selfies collection. 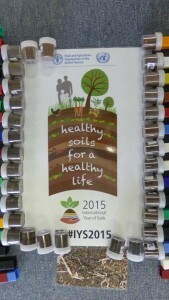 In the end, the floor diagram (right) shows the IYS theme surrounded by different colours of soils, and further ring of different uses of soil for a heathy life. The Science process is especially exemplified through recording and sharing what we think we know to develop a class definition of soil. The children collected and brought from home small (top)soil samples and a Soil Story about its use and value to them . 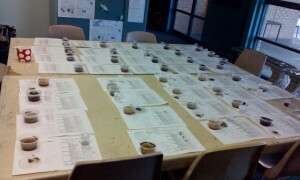 We ranked the brown colour shades of these soils from darkest to lightest and were amazed to not find a repeat. 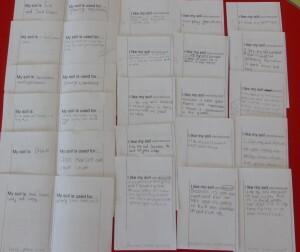 The children read their values for their soil in situ for their healthy uses in their lives. 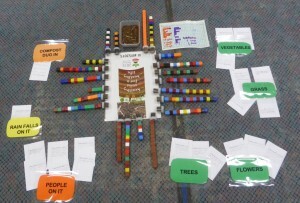 In the end, the floor diagram (right) shows the IYS theme poster with the school tub of soil, and all the home soil vials (on the edge of the poster), beside towers recording the number of signs of a healthy life from their soils, and then cards showing the most important values held by the children for the soil in their life from their My Soil Story booklets (photo right). The Science process is especially exemplified through the “Odd One Out” discussion whereby sharing what we see provides different perspectives. Together, these reveal the materials that make up soil. 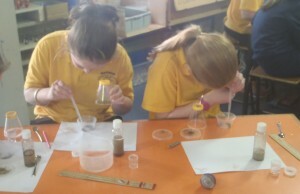 The children examined their home soil samples using physical and chemical tests to reveal their reaction to water (photo right), their (texture) names and their pH. In the end, the table top (photo below right) shows all the home soil samples in tubs, with their record sheets for soil contents, reactions to water, pH and soil (texture) names. The Science process is especially exemplified through the physical and chemical tests whereby sharing what we see provides greater understanding of the similarities and differences between soils in our area, and their good and poor properties for our uses. 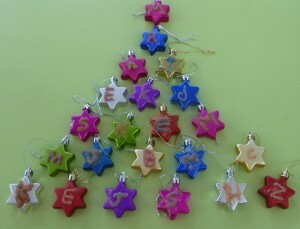 4 puts art into science by making “IYS Soil Stars” which have our initial covered in a sandy soil, on a star (photo below right) with an IYS logo on the other side. The Science process is especially exemplified through the regional observations that took place and were recorded in various ways and are now shared to gain a regional overview of our soil types. 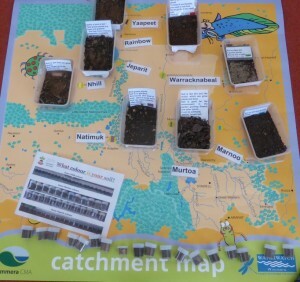 Thankyou : I am grateful to everyone who has supported this program, especially the teachers at each school, the Wimmera Catchment Management Authority for funding the in-class time, and the IASS for funding most of the Soil Selfies photos (first used in Berlin for Global Soil Week), and for all the people who contributed Soil Selfies. This program is created and delivered by Jeanie Clark, enviroed4all(R) in 2015. If you use it and have feedback for me, I would like to hear from you. 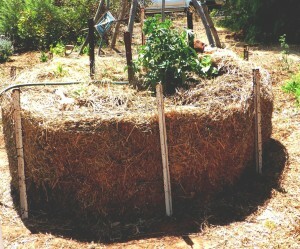 Most of the work creating this project was unfunded, so if you would like to support me financially, please email me.